There must be at least one working smoke alarm within three metres of a "sleeping" door (for example a study with a bed). In self-contained caravans, sleep outs or similar areas, there must be a minimum of one working smoke alarm. If you have a multi-storey or multi-level home, there must be at least one smoke alarm on each level or storey. It is also essential for tenants to know that they are responsible for changing batteries in smoke alarms during their tenancy and for informing the landlord of any problems with the smoke alarms as soon as possible. However, landlords are responsible for ensuring the smoke alarms are working at the beginning of every new tenancy. If you are installing new smoke alarms or if you are replacing an existing smoke alarm, you must install a photoelectric smoke alarm with long life batteries that have a lifespan of at least eight years. Look for it explicitly stated on the packaging before it is installed. When buying a new smoke alarm, it is also important to note if the alarm complies with one of the following manufacturing standards: Australian Standard AS3786:1993; or equivalent international standard: UL217 (USA), ULCS531 (Canada), BS5446: Part 1 (United Kingdom), BS EN 14604 (United Kingdom) or ISO12239 (International). This should be prominently displayed on the packaging and on the alarm. If in doubt, ask the hardware retailer which smoke alarms comply with the required standards. According to the manufacturing standard, long-life photoelectric alarms must have a service life of at least eight years under normal conditions and have the date of manufacture marked. You should replace the smoke alarms within eight years of the manufacture date or earlier if the low battery warning sounds. We recommend having professional go in and check alarms between tenancies to ascertain that these are all working, haven’t been tampered with, and reaching the correct decibel level. Keep in mind that if there are smoke alarms already installed but they are not long-life photoelectric smoke alarms they do not need to be replaced as long as they are in the required locations and their recommended replacement date hasn’t passed. In many cases, the replacement date will be listed on the alarm. But if there is no replacement date on the alarm, the alarm is more than eight years old, or you don’t know how old the alarm is, you will need to replace it with a photoelectric smoke alarm to be certain you are complying with regulations. Note that this is the minimum requirement, meaning you may wish to consider installing multiple alarms to provide a higher level of protection for the rental home and its occupants. For boarding houses, the regulations are similar. There must be at least one smoke alarm installed in each tenant’s boarding room or within three metres of the entrance (or main entrance) to each tenant’s boarding room. In addition, a smoke alarm must be installed on each storey or level of the boarding house, even if there isn’t a boarding room on that level. 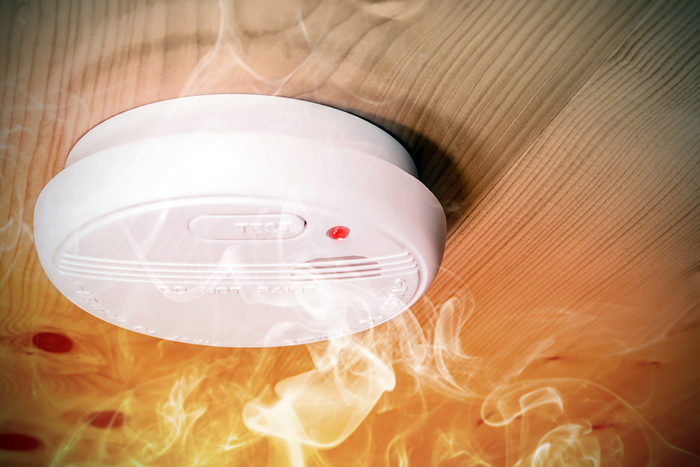 If you are a tenant, take note that you are responsible for replacing the smoke alarm batteries in your room. On the other hand, landlords are responsible for replacing smoke alarm batteries in common areas like hallways and the kitchen. At Click, we engage professional smoke alarm installers and test all smoke detectors. We also highly recommend annual checking. In addition, we can provide a one-off thorough inspection to ensure all smoke alarms are functioning properly in your property. For more information about these requirements and our smoke alarm testing visit Tenancy Services, the NZ Fire Service’s website Fire.org, or ask one of our knowledgeable Property Managers at Click.